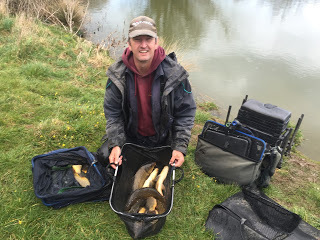 I was due to fish a pairs match at Summerhayes today and tomorrow but with only a few booked in, Pete made the decision to cancel the pairs and just run two individual matches instead so I decided to stay local today and fish at Harrys with a few others and then fish Longs tomorrow. I picked Hurf up on my way as he’d had van troubles and met the others at Cartgate for breakfast. We decided to leave out the two pegs on either side of the reeds as they’ve been dominating the matches and Harry spread the pegs so everybody would all have plenty of room. I fancied peg 13 where Alex Murray had done well in the pairs a few weeks back but pulled out 15 which is still a decent peg. The weather had been gorgeous on Friday and I even sat outside tying some rigs up in the sunshine but it looked like we weren’t going to be so lucky today or tomorrow with Storm Katie due to batter the South West. Although as we drove to the venue, it was quite bright so maybe they’d got it wrong! We unloaded the kit and as I walked to my peg I was met by Hurf and Harry who said a tree had gone down in my swim and I could fish either peg 1 or 14 instead, I chose the former even though it hasn’t been great in the previous two matches as the wind would be side on rather than in my face. 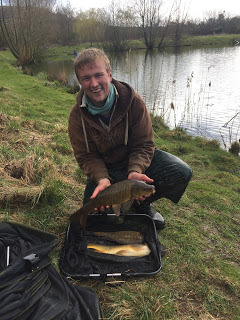 I set up a 0.4 gram Drennan Carp float to fish at 10 metres and a Carpa 2 float to fish at 5 metres and also at 10 metres to my left where there were some dead reeds. For bait I had corn, maggots plus some 4mm SSP Baits Dark Silt pellets which I covered in water for a few minutes to soften them up. Hurf shouted the all in and I cupped in half a pot of 4mm’s, maggots and corn on all three lines before starting at 10 metres straight out in front, I had toss pots fitted to my top kits and would feed a few pellets and a couple of grains of corn every put in. After a couple of minutes, the float sunk from view and carp number one was soon in the net, next chuck I had another and it was solid, mainly small carp between 12oz and 2lb and I could see most people catching fish. 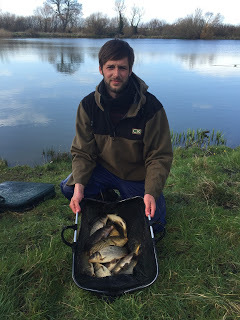 After about three quarters of an hour I was on twelve fish and shouted up to Steve P on peg 3 to see how he was getting on and he replied he had six, so I was doing okay at this early stage. I was catching on corn and after an hour I was up to sixteen carp, I cupped in some more feed on the other two lines but in the previous two matches I never had a bite on the shorter lines. Hour two was similar and I added another thirteen carp and if I could keep this up I would be on for a big weight but going into the third hour, we started to get some rain and the wind was picking up. 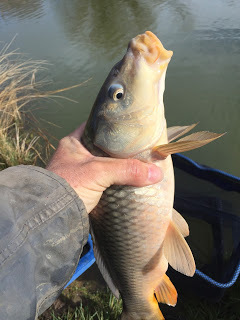 I had a few more carp plus a rudd from 10 metres but bites were slowing up a little so I cupped in some feed before trying five metres to let it settle. I missed a bite after a few minutes and then I happened to look away for a minute and the pole was dragged round by an angry carp! I added a few more but they were on the small side so I had a look down by the reeds. I had to wait a while for a bite but my first fish was a decent one of 3-4lb and several more followed. I had another thirteen fish to put me on 42 carp (and a rudd) after three hours. I’d only lost a couple of fish although I did have a few hairy moments when I struck into a carp and the line had wrapped round the pole tip but thankfully it came off without any damage done. The weather was now pretty horrible although to be honest me and Steve P were relatively sheltered compared to the others on the far bank who were getting it right in the chops! I got to 50 carp before going back to the car to get a third keepnet. 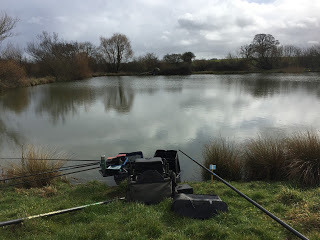 I carried on getting odd fish by the reeds but it slowed up so I tried five metres again but didn’t have anymore fish there, back at 10 metres in open water I was expecting to bag up after resting it for a good while but I was having to wait ages for a bite there as well. I could see Jake catching really well on the far bank but Hurf looked to be struggling and Harry’s cause wasn’t helped when his top two came off while playing a good carp and it did a very good Excalibur impression before finally disappearing from view! For the remaining part of the match I swapped between the two ten metre lines, catching the odd fish from each until Hurf called an end to proceedings, I ended up with 61 carp plus that solitary rudd. I packed up before we went round to start the weigh in with Hurf, he was looking very wet and windswept but still weighed in 34lb 15oz before Harry had 24lb 6oz, next up was Jake and after several weighs his final total was 64lb 14oz and I thought I might have a little more than that. Steve P said he’d caught mainly pasties and had nowhere near Hurfs weight but like most anglers he can’t lie straight in bed and weighed 48lb 1oz. 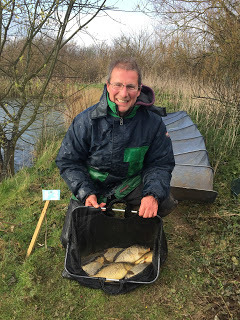 Then it was my turn and after I’d emptied all three nets, my total was called out at 94lb 9oz and I’d fallen just short of the my third 100lb plus weight but still a lovely days fishing and I picked up £45 plus nuggets from Hurf and Steve P.
Hurf had 34lb 15oz from his armchair peg! 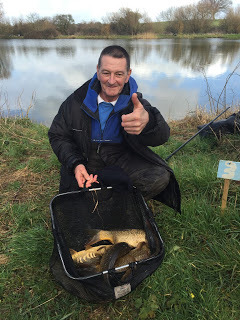 Steve P with some of his ‘pastie’ carp! I’d just like to say thanks again to Harry for letting us fish the pond and another £25 went into his charity pot for The British Heart Foundation, a great cause.